DS 6878-HC - Efficiency made possible! 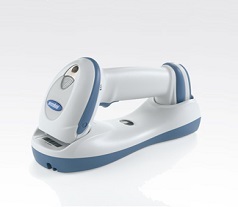 The DS6878-HC cordless imager from Motorola enables hospitals to automate data capture, improve data accuracy, increase productivity and streamline everyday processes in patient rooms, admitting, laboratories and the pharmacy. An intuitive and ergonomic design combines with dependable and rapid capture of bar codes and other images, allowing caregivers to remain focused on the patient — not the technology. Helping to prevent medical errors, improve patient safety and increase caregiver productivity.